Python is a high-productivity dynamic programming language that is widely used in science, engineering, and data analytics applications. There are a number of factors influencing the popularity of python, including its clean and expressive syntax and standard data structures, comprehensive “batteries included” standard library, excellent documentation, broad ecosystem of libraries and tools, availability of professional support, and large and open community. Perhaps most important, though, is the high productivity that a dynamically typed, interpreted language like Python enables. Python is nimble and flexible, making it a great language for quick prototyping, but also for building complete systems. But Python’s greatest strength can also be its greatest weakness: its flexibility and typeless, high-level syntax can result in poor performance for data- and computation-intensive programs. For this reason, Python programmers concerned about efficiency often rewrite their innermost loops in C and call the compiled C functions from Python. There are a number of projects aimed at making this optimization easier, such as Cython, but they often require learning a new syntax. Ideally, Python programmers would like to make their existing Python code faster without using another programming language, and, naturally, many would like to use accelerators to get even higher performance from their code. In this post I’ll introduce you to Numba, a Python compiler from Anaconda that can compile Python code for execution on CUDA-capable GPUs or multicore CPUs. Since Python is not normally a compiled language, you might wonder why you would want a Python compiler. The answer is of course that running native, compiled code is many times faster than running dynamic, interpreted code. Numba works by allowing you to specify type signatures for Python functions, which enables compilation at run time (this is “Just-in-Time”, or JIT compilation). Numba’s ability to dynamically compile code means that you don’t give up the flexibility of Python. This is a huge step toward providing the ideal combination of high productivity programming and high-performance computing. With Numba, it is now possible to write standard Python functions and run them on a CUDA-capable GPU. Numba is designed for array-oriented computing tasks, much like the widely used NumPy library. The data parallelism in array-oriented computing tasks is a natural fit for accelerators like GPUs. Numba understands NumPy array types, and uses them to generate efficient compiled code for execution on GPUs or multicore CPUs. The programming effort required can be as simple as adding a function decorator to instruct Numba to compile for the GPU. For example, the @vectorize decorator in the following code generates a compiled, vectorized version of the scalar function Add at run time so that it can be used to process arrays of data in parallel on the GPU. To compile and run the same function on the CPU, we simply change the target to ‘cpu’, which yields performance at the level of compiled, vectorized C code on the CPU. This flexibility helps you produce more reusable code, and lets you develop on machines without GPUs. One of the strengths of the CUDA parallel computing platform is its breadth of available GPU-accelerated libraries. Another project by the Numba team, called pyculib, provides a Python interface to the CUDA cuBLAS (dense linear algebra), cuFFT (Fast Fourier Transform), and cuRAND (random number generation) libraries. Many applications will be able to get significant speedup just from using these libraries, without writing any GPU-specific code. For example the following code generates a million uniformly distributed random numbers on the GPU using the “XORWOW” pseudorandom number generator. Anaconda (formerly Continuum Analytics) recognized that achieving large speedups on some computations requires a more expressive programming interface with more detailed control over parallelism than libraries and automatic loop vectorization can provide. Therefore, Numba has another important set of features that make up what is unofficially known as “CUDA Python”. Numba exposes the CUDA programming model, just like in CUDA C/C++, but using pure python syntax, so that programmers can create custom, tuned parallel kernels without leaving the comforts and advantages of Python behind. Numba’s CUDA JIT (available via decorator or function call) compiles CUDA Python functions at run time, specializing them for the types you use, and its CUDA Python API provides explicit control over data transfers and CUDA streams, among other features. 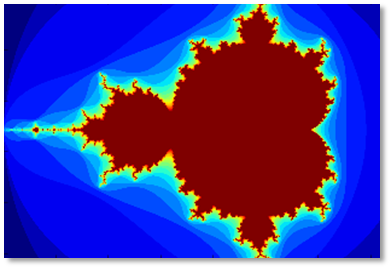 The following code example demonstrates this with a simple Mandelbrot set kernel. Notice the mandel_kernel function uses the cuda.threadIdx, cuda.blockIdx, cuda.blockDim, and cuda.gridDim structures provided by Numba to compute the global X and Y pixel indices for the current thread. As in other CUDA languages, we launch the kernel by inserting an “execution configuration” (CUDA-speak for the number of threads and blocks of threads to use to run the kernel) in brackets, between the function name and the argument list: mandel_kernel[griddim, blockdim](-2.0, 1.0, -1.0, 1.0, d_image, 20). You can also see the use of the to_host and to_device API functions to copy data to and from the GPU. You can get the full Jupyter Notebook for the Mandelbrot example on Github. On a server with an NVIDIA Tesla P100 GPU and an Intel Xeon E5-2698 v3 CPU, this CUDA Python Mandelbrot code runs nearly 1700 times faster than the pure Python version. 1700x may seem an unrealistic speedup, but keep in mind that we are comparing compiled, parallel, GPU-accelerated Python code to interpreted, single-threaded Python code on the CPU. Numba is a BSD-licensed, open source project which itself relies heavily on the capabilities of the LLVM compiler. The GPU backend of Numba utilizes the LLVM-based NVIDIA Compiler SDK. The pyculib wrappers around the CUDA libraries are also open source and BSD-licensed.